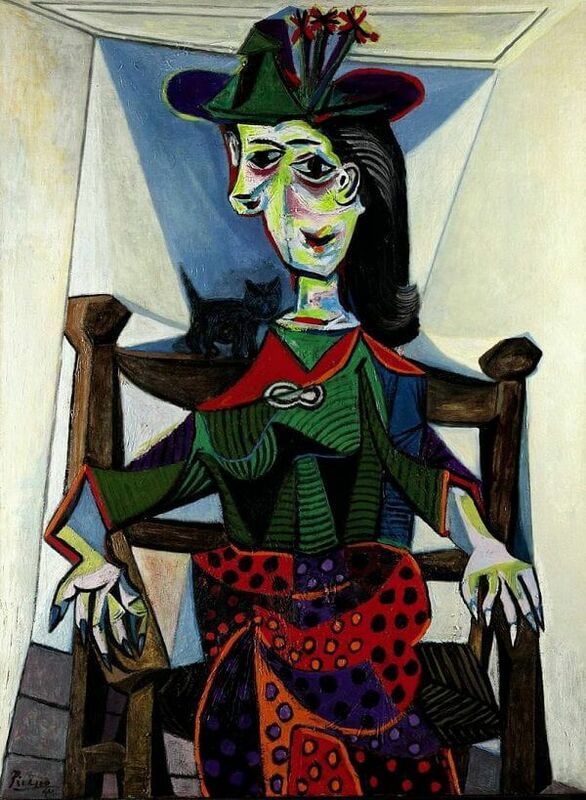 Dora Maar au Chat presents the artist's most mysterious and challenging mistress regally posed three-quarter length in a large wooden chair with a small black cat perched behind her in both an amusing and menacing attitude. The faceted planes of her body and richly layered surface of brushstrokes impart a monumental and sculptural quality to this portrait. The painting is also remarkable for its brilliance of colour and the complex and dense patterning of the model's dress. The powerful figure is set in a dramatic, yet simple setting composed of a vertiginously inclined plane of wooden floorboards and shallow interior space that is arranged in a manner reminiscent of Picasso's earliest manipulations of space in a cubist manner. Dora Maar au Chat is one of Picaso's most valued depictions of his lover and artistic companion. Their partnership had been one of intellectual exchange and intense passion Dora was an artist, spoke Picasso's native Spanish, and shared his political concerns. She even assisted with the execution of the monumental Guernica and produced the only photo-documentary of the work in progress. She was an intellectual force, a characteristic that both stimulated and challenged Picasso and her influence on him resulted in some of his most powerful and daring portraits of his 75-year career. Among the best of them are the oils completed during the late 1930s and early 1940s, when Picasso's art resonated with the drama and emotional upheaval of the era and which Dora came to personify. The luminous Dora Maar au Chat was painted in 1941, at the beginning of the Second World War in France. Maar was one of the most influential figures in Picasso's life during their relationship and she also became his primary model. By the time he painted the present picture he had incorporated Dora Maar's image into countless versions of this motif. During the occupation of Paris by the Nazis, and as tension mounted in their relationship, the artist would express his frustration by furiously abstracting her image, often portraying her in tears. While the present portrait might seem a departure from Picasso's more hostile depictions of this model, it may be one of his most brilliant and biting provocations of his the Weeping Woman. Picasso once likened Maar's allure and temperament to that of an Afghan cat, and the cat in this picture is laden with significance. In the history of art, the pairing of cats and women was an allusion to feminine wiles and sexual aggression, as exemplified in Manet's notorious Olympia. It is also interesting to consider that the artist has paid particular attention to the sharp, talon-like nails on the long fingers of his model. In life Maar's well-manicured hands were one of her most beautiful and distinctive features, and here they have taken on another, more violent characteristic. In addition to being a rare, three-quarter length portrait of Dora Maar, the present work is also a generous and painterly composition with an extraordinary attention to detail. The artist used an extraordinarily vibrant palette in his rendering of the angles of the chair and the patterning of Maar's dress. The most embellished and symbolic element of the sitter's wardrobe in this picture is her hat, Maar's most famous accessory and signifier of her involvement in the Surrealist movement. Ceremoniously placed atop her head like a crown, it is festooned with colourful plumes and outlined with a band of vibrant red. Larger than life, an impression enhanced by her vibrant body that cannot be confined by the boundaries of the chair, Maar looms in this picture like a pagan goddess seated on her throne. 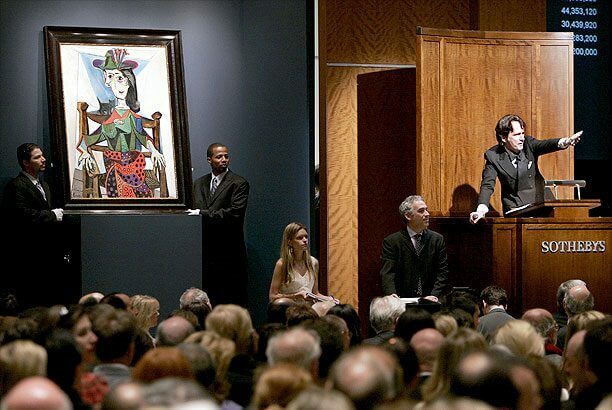 Dora Maar au Chat was sold with a final bid of US$95,216,000 in an auction of Impressionist/Modern works held at Sotheby's on May 3, 2006 in New York, and make it the second-highest price ever paid for a painting at auction.